Contents note: 1. Widdop -- 2. Phaetons -- 3. Relic. 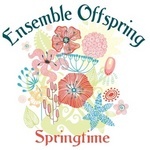 17 Sep 2009: at Ensemble Offspring Soloists (Callaway Music Auditorium). Featuring James Cuddeford, Damien Ricketson, Bernadette Balkus, Claire Edwardes. 30 May 09: featuring Ensemble Offspring. 29 Apr 2009: at Ensemble Offspring (Melbourne Recital Centre, Primrose Potter Salon). Featuring Ensemble Offspring. Jan 01: San Diego, USA. Featuring Morris Palter, Janos Negyesy, Andrew Infaniti.